The “Back to the Future” movies were a trilogy named I, II and III and released in 1985, 1989 and 1990.1 As fans of the series remember, BTF II was the only one which portrayed a look at the future twenty-six years later. 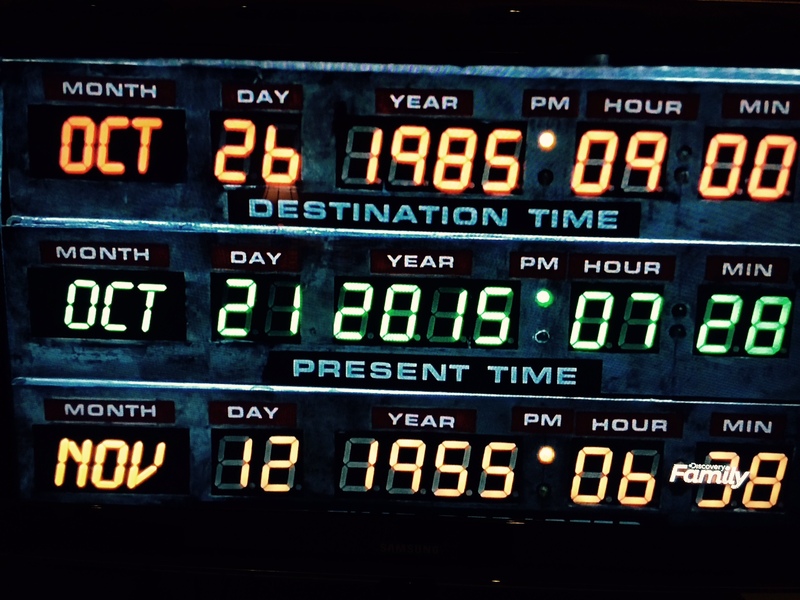 The actual date used in the movie, October 21, 2015 – has arrived! As with other movies attempting to predict the future, it’s interesting to compare the creativity of the past with what actually came to be. Such is the case with Back to the Future II. Following is a comparison of the predicted future created in the late 1980’s with what we have today. 1)	FLYING AUTOMOBILES: In the 1960’s, the year 2000 was thought of with much imagination, as if it would represent a threshold where our lives would be so fantastic that they would have little resemblance with the early years of the Space Age. While flying automobiles in 1989 might have been viewed as merely an extension of that unrealistic vision, it came much closer to reality after all. 2)	SLEEP INDUCING ALPHA RHYTHM GENERATOR: In the movie, Doc Brown, Marty and his girlfriend Jennifer travelled to 10/21/2015 to prevent a future family crisis. Doc had not planned on bringing her along, but he stated he couldn’t leave her behind with the knowledge of the flying DeLorean/ time machine. In addition, her curiosity about her future could lead to dangerous attempts at intervention upon her return. Therefore, he used the sleep generator to make her unconscious and when she would awaken, would have no conscious knowledge of what happened – it would seem as a dream. 3)	WEATHER PREDICTION TO THE MINUTE: BTF II had the full range of prognostication from “since when can weathermen predict weather” by Marty in 1955 when the radio predicted clear weather hours before the storm to when Doc Brown noted that the rain ended exactly as predicted to the minute in 2015. Of course, we aren’t there yet, although rain delayed major league baseball games are often given a 5-10 minute window for bad weather to start or end based on radar scans. We have come a long way from the early days of satellite meteorology when the newest available forecast was relatively accurate only for the day after next. 6)	KIDS WEAR THEIR PANTS POCKETS INSIDE-OUT IN 2015: This was found to be rather amusing when this movie was released in 1989 and many probably find it just as strange today. But why? After all, it has been fashionable for several year years to buy new jeans with slashes and rips throughout. Inside-out pockets can be fixed, but “distressed” is forever. 8)	BINOCULARS with COORDINATES and DATA: When Doc was looking at Marty, Jr. from a distance, his binoculars appeared to give data on the subject’s travel. Maybe not binoculars, but we do have StatCast which gives data on replays of home runs, great defensive plays and baserunning such as distance, speed, route efficiency, etc . 9)	TAKE A $50 BILL TO BUY A PEPSI? : In all fairness, Doc didn’t tell Marty that he would need most of that $50 to get a Pepsi. The implication was that prices would accelerate as they had been throughout the early part of the decade of the 1980’s so that a lot more would be needed for such a purchase in our time. Inflation ranged from a monthly annualized rate of 14.8% (during the last year of the Carter Administration when the prime rate hit 20%) to 1.1% in late 1986.12 Using the median inflation rate of 4.3% for that decade, the 2-liter of Pepsi priced at 89 cents13 would be about $3.15 today. With the median inflation taken from 1980 (13.5%), we arrive at a 2-liter price of $21.10. So, it’s a combination of leftover fear of high inflation (just ask Baby Boomers) and a little Hollywood license. As wondrous as these inventions are, how soon before some attempt to use electronics to create the super-humans Hitler could only dream about? It’s an ethical and moral dilemma. The use of medication and technology to cure or minimize a disability is not the same as attempting to gain “an edge” on other humans by going beyond the natural boundaries of human capability. Trouble with that? Absolutely. We can start with the “logo of the Second International Congress of Eugenics (which) proudly proclaimed, ‘Eugenics is the self-direction of human evolution.’… In Dignitas Personae, published in 2008 by the Catholic Church’s Congregation for the Doctrine of the Faith, it said ‘such manipulation would promote a eugenic mentality and would lead to indirect social stigma with regard to people who lack certain qualities,’ which ‘would be in contrast with the fundamental truth of the equality of all human beings’… ‘that in the attempt to create a new type of human being one can recognize an ideological element in which man tried to take the place of his Creator.’”17 For those of faith who acknowledge the existence of an eternal after-life, trying to live forever is contrary is thumbing our noses at God and His creation. 11)	“CAFÉ ‘80’s”: Returning to a lighter topic, we certainly have much interest in “vintage” items, styles and practices today! Sadly, no one envisioned that the Michael Jackson on the café’s screens would not be with us on this day. “The robotic machine operates along a track and is designed for installation at a traditional gas station fueling bay by taking the place of a stationary pump. As the driver pulls up to the bay, an infrared scanner on the robot casts a light to locate the vehicle’s fuel door by identifying the shadow that is created by the gap between the fuel door and the vehicle’s body panel. A suction cup attached to an adjustable arm on the robot opens the vehicle’s fuel door. The system works with a pull-out, push-in or latch-release fuel door. If the fuel door is locked, the driver will be alerted to spring the latch, officials at Husky demonstrated during the run-through at the plant using a mock-up of the driver’s side panel of a Ford Mustang. 14)	“CUBS WIN THE WORLD SERIES — OVER MIAMI?”: A little future shock for baseball fans in 1989. At the movie’s release, the Cubs hadn’t been to the World Series since 1945. (And the MLB team based in southern Florida didn’t arrive until 1993.) That forty-four year drought is now seventy years with a little help from manager Dusty Baker allowing the Steve Bartman foul ball incident in 2003 to overshadow the game and produce the managerial brain-freeze which cost the Cubs a shot at the World Series… Ironically against the Florida Marlins who are now designated “Miami”! Unfortunately, the 2015 New York Mets didn’t follow the script and eliminated the Cubs in the NLCS last evening. 15)	NO-HANDS VIDEO GAMES: After Marty shows off his shooting expertise on a vintage game machine, the young boys scoff at the notion of a video game so primitive that hands are required to operate it. Of course, telepathic games are nowhere to be found yet. However,“in a recent experiment, a person in India said ‘hola’ and ‘ciao’ to three other people in France. Today, the Web, smartphones and international calling might make that not seem like an impressive feat, but it was. The greetings were not spoken, typed or texted. The communication in question happened between the brains of a set of study subjects, marking one of the first instances of brain-to-brain communication on record.”21 The process was a very slow one (see the accompanying footnote), but gives reason for optimism. “A record 209,800 primary and secondary school teachers reported being physically attacked by a student during the 2011-2012 school year, according to new data released… by the federal government. The data was published in “Indicators of School Crime and Safety,” which was released yesterday by the Justice Department’s Bureau of Justice Statistics and the Department of Education’s National Center for Education Statistics. The 209,800 teachers who were attacked by students in 2011-2012 outnumber the population of Salt Lake City, Utah, which is 189,384. 17)	HOVER-BOARDS: Where are we on creating this levitating skateboard? The good news is that this technology has advanced from the Stone Age! Before we become too excited, we must remember that something of this magnitude will take a lot more time and $. As it stands, or rather floats, the “Hendo hoverboard” (named by Arx Pax founders, Greg and Jill Henderson) is noisy and lasts for just seven minutes. Still, this is a breakthrough. The company Arx Pax was started initially to figure out a way to make buildings more earthquake-proof by lifting them off the ground in a way similar to technology used in bullet trains. So, the founders reasoned it made sense to prove the technology on a small scale before advancing. Thus, we have the Hendo, priced at $10,000.25 Stay tuned. 19)	“LITHIUM MODE ‘ON’”: So said the intelligent home climate control when the Marty of the future arrived after work. “Intelligent” homes can control many facets of the house, but not the mood of ourselves yet. Modern technology makes hvac and lighting more efficient by adjusting usage to actual needs. Parameters can be programmed by the homeowner or sensors which can determine whether someone is in a particular room or even at home. Cost-saving “yes” – security and privacy “NO.” Something to consider. 20)	“THE ATROCITY CHANNEL”: Marty Jr. referred to this during some friendly parent/teenager banter at dinner. With the proliferation of television channels currently available and the increasing interest in degenerate forms of “reality” shows, can this be far off? This was spoken by the boss future Marty seconds after he used a card scanner to enter into an illegal deal with a fellow worker. Two things here. One, the large phone television screen, known today as “Skype,” was first available in 2003.27 Two, it shows the interconnectedness of our Electronic Age. Many things can be done “seamlessly.” As with any advancing technology, we need to be on our guard that the basic respect for human dignity (security, privacy) is not compromised. The need-to-be-connected-at-all-times mentality has become more prevalent due to the increased impersonal nature of our jobs, communications and lives. 22)	$174 CAB RIDE AND FINGERPRINT PAYMENT: Biff had been following the DeLorean to where the policewomen took the Jennifer of 1985 to her home in 2015. The cab ride was paid for by Biff using his fingerprint on a payment machine. The cab fare isn’t far off. A friend of mine recently paid $90 for a ride from the Nashville airport to Murfreesboro. 23)	“The school burned down six years ago.”: This came from the Mr. Strickland of the distorted 1985 in response to Marty’s “Don’t you remember you gave me detention last week?” Well, the social deterioration in schools as noted in item #16 hasn’t reached this stage yet. However, unless the well-being of the family and timeless values are re-established in our communities, we can be sure this current trend joined with recent Supreme Court decisions and implementation of social engineering promoted by Common Core will produce this inevitable chaos. 24)	Destroyed Library: Marty and Doc Brown find the Hill Valley library is a complete wreck. Knowledge is no longer a priority in this time. For those who criticize skeptics of Common Core, please see the 5-part series on the subject at the http://www.ohioconservativereview.com. 25)	“CRACKPOT INVENTOR DECLARED LEGALLY INSANE”: Such was the headline in a newspaper in the distorted 1985. This was clearly a libelous, smear campaign getting back at people who did not consent to the new society which the greedy, future Biff had created. We wouldn’t have that now, would we? Not to that extent – yet. It starts with misusing the language to imply that those who don’t fall in line with politically correct thinking are made to appear unstable psychologically. “Islamophobia” may be correct if the individual has an unfounded fear of all who practice that faith. However, it is now a favorite label given to anyone who believes that we are in a religious war, which we are.31 Then, there’s the favorite of the Left: “homophobia” (which actually means an irrational fear of human beings). Those who understand that marriage does not come from the state and that even the Church cannot change the requirement that it must be between one man and one woman are not fearful of those who have homosexual tendencies as the fabricated term implies. This brings up another future possibility. It is clear that Natural Law and common sense are being discarded in favor of relativism.32 It would also be logical, then, for advocates of stricter requirements for gun ownership to distort what is considered legally insane to make it essentially impossible for any law-abiding citizen to own one. 26)	THE RICHEST AND MOST POWERFUL MAN IN HILL VALLEY: Here is a town which is run and over-burdened by the guy with the casino who’s in it for himself. Could that happen on the Presidential level?…..
27)	“Kid, I OWN the police.”: Except for a few stray, rural communities, this practice is all but dead. But what is the state of our local law enforcements across the nation? … Much has changed since the actual 1985. The question remains: Are we experiencing the progression from the actual 1985, or from Biff’s 1985? And is “Brave New World” far off? Becoming a butthead will be the least of our worries. 11 – “The 50-page procedure required Stossel to answer questions which included obscure weapons terms which had no relevance to the application (e.g.”dirk,”stiletto,” and “gravity knife”)… Stossel on the required fee: “I can afford the $430 application fee, but there are poor people who can’t afford that and can’t afford to take the time off from work to apply… Stossel was denied a gun because he could not present a “special need” for having one. He produced copies of death threats against him, but they were discounted because he had not reported them to the police. ” from https://cartaremi.wordpress.com/2014/01/16/anti-second-amendment-proponents-simulate-tactics-from-minority-voter-discrimination-days/, taken from the 1/14/2014 edition of “the O’Reilly Factor. 22 — https://en.wikipedia.org/wiki/Touchscreen, with footnotes A) Johnson, E.A. (1965). “Touch Display – A novel input/output device for computers”. Electronics Letters 1 (8): 219-220. doi:10.1049/el:19650200, B) USPTO. “DISCRIMINATING CONTACT SENSOR”. Google. Retrieved6 April 2013 and C) oakridger.com, “G. Samuel Hurst — the ‘Tom Edison’ of ORNL”, December 14 2010. 27 – “Skype was created in 2003 at a company founded by Niklas Zennström and Janus Friis. Originally called Skyper, it was later shortened to Skype when it was discovered that Skyper wasn’t available with all Internet domains… Basically, Skype converts voice signals into data, sends that over the Internet from the host computer, and then restores the audio on the receiving computer. You might hear people refer to it as “VoIP” which stands for “Voice over IP”. The system is free between two Skype-linked computers, and has only a small fee if the person on one end is using a conventional phone.” From “A Brief History of Skype,” by Rob Whent, http://www.itbusiness.ca/blog/a-brief-history-of-skype/20750, 6/21/2012. 33 – remark by President Obama as reported in “Obama: ‘Trayvon Martin could have been me,” by Tom Cohen, http://www.cnn.com/2013/07/19/politics/obama-zimmerman/, 7/19/2013. 34 – remark from Baltimore Mayor Stephanie Rawlings Blake as reported in “Baltimore Officials Admit They Gave Police Stand Down Order During Violent Riots,” by Jim Hoft, http://www.thegatewaypundit.com/2015/07/baltimore-officials-admit-they-gave-police-stand-down-order-during-violent-riots/, 7/1/2015. 35 – “Police Departments Walk Fine Line After Shootings,” by Scott Calvert and Zusha Elinson, The Wall Street Journal, 8/7/2015. 36 – “Murder Rates Rising Sharply in Many U.S. Cities,” by Monica Davey and Mitch Smith, http://www.nytimes.com/2015/09/01/us/murder-rates-rising-sharply-in-many-us-cities.html?_r=0, 8/31/2015.